One of the strongest supporters and benefactors of the Jefferson Pipe Band, Georgina Knox Burns passed away peacefully at home on August 30, 2018. Georgina Knox was born on November 30, 1917 in Geary, Indiana. Her parents were Scottish Immigrants and she was forever proud of her Scottish heritage. 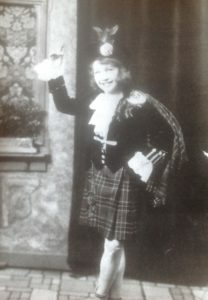 She married Jack Muir Burns from Lanark, Scotland and was extremely proud to have a bagpiper march her down the aisle. Her favorite hobby was dancing with Jack. Her love of dancing was well known to all of Georgina’s family and friends. She would have loved to have accompanied the band in its inaugural trip to “The Worlds” in 2017. She was physically unable to travel so a group of us took her with us in the form of a picture. We took pictures of members of the band holding her picture in Glasgow, Aberlour, Craigellachie and most everywhere we traveled in Scotland. Being marched down the isle at her wedding by a bagpiper. Celebrating her 60th wedding anniversary in her husband’s home town of Lanark with her family by her side. Celebrating her 100th birthday with family and friends and bagpipers by her side. Four members of the Jefferson Pipe Band played for the celebration. 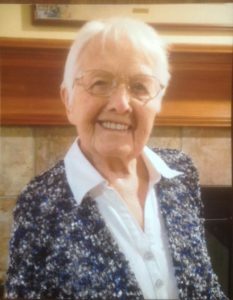 Georgina Knox Burns died August 30, 2018 peacefully at home. Her room was draped in Scottish tartans and she passed away with her beloved memories of Scotland, Jack, her family, a picture of the Jefferson Pipe Band at Piping Live! In Glasgow and a Lindsay tartan nearby, a gift from the Jefferson Pipe Band. We are posting this today in honor of what would have been Georgina’s 101st birthday, November 30, 2018. We trust she’s in Heaven with her husband, Jack, other family members, friends and, of course, bagpipers!